The song Absinthe Frappé comes from the Broadway musical, It Happened In Nordland. 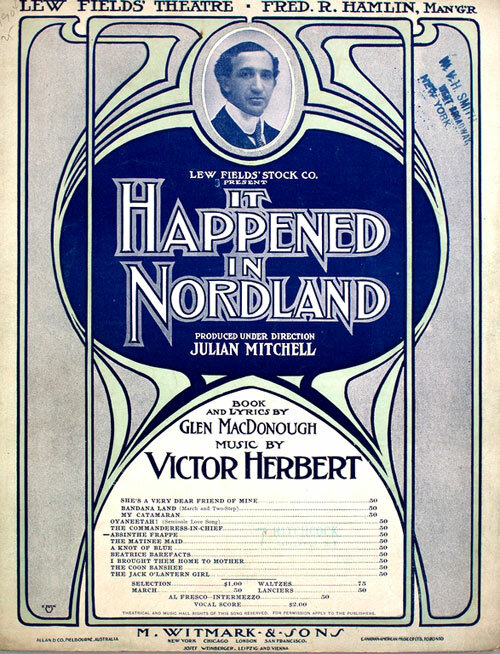 A musical comedy in two acts with a prologue, it was set in the fictional towns Kronenberg and Elsa Bad in the equally fictional country of Nordland. Written by Glen MacDonough, with music by Victor Herbert, the show opened in December of 1904 at Lew Fields' Theater on Broadway near 42nd Ave. It was the first show played in the theater, and if the review reproduced below is to be believed, it was very well received. And bid him bring a cold and tall absinthe frappé! That so heavily hang o'er your soul. You imbibe your absinthe frappé! The deed is done so waste no woe o'er yestereen. Nor swear to shun a year or so the festive scene. Before a glass of rightly-made absinthe frappé! 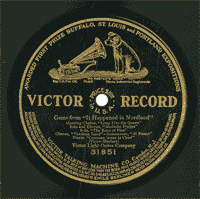 "It Happened in Nordland" Scores on First Night. Capable Company Supports Lew Fields and Marie Cahill. "It happened in Nordland" because it couldn't have happened anywhere else. It is too delightful and dainty for the sure-enough countries of the-workaday world, and when Glen McDonough put it in words and Victor Herbert set it to music and the pair of them turned it over to Lew Fields to open his new theatre with, they rendered that actor-manager a service, by virtue of which he may well keep his pretty playhouse packed for many a moon to come. Before the curtain rose, the gathering of first-nighters which filled every seat and stood up whenever it could find room, admired the newest theatre in New York enthusiastically. It was well worthy of all the admiration bestowed upon ft, too, for, once inside-the entrance Is not as commodious as it might be-a vision of green and white and gold, with three tiers of boxes well arranged, is revealed. As soon as the curtain went up, however, there was no time for further inspection of the house. 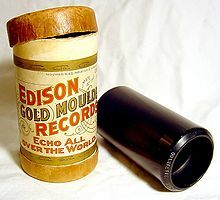 The musical comedy claimed attention. he has surrounded himself to display their talents. Naturally, there isn't any too much of a plot. Marie Cahill, as the American Ambassadress to the Court of Nordland, takes the place of the Queen for a day and a night, that illustrious personage having disappeared, and finds her long-lost brother in Lew Fields. The long lost brother is in all kinds of trouble, and is more than willing to be saved. The Court personages, quaintly conceived, are full of plot and counter-plot, and there are enough love affairs to keep the full complement of sweethearts busy. timers sit up and take notice. It has been a long time since any production has been more generously staged, and some of the pictures evolved as the play progressed evoked burst after burst of applause. This was notably true of the carnival scene in the second act.Lew Fields is well fitted in the part assumed by him. His peculiar brand of comedy, in all the wealth of its misfit pronunciation, is right at home in it. Miss Cahill was also well suited in her role.